An exhibition program that utilizes the basic form of a large display case, playing host to recurring exhibitions and installations by artists whose practices explore the intersections of media, advertising, art, and consumerism. Generational linearity is gone. An ageless youth demands emancipation. The assertion of individuality is a rite of passage. The most different thing to do is to reject being different all together. Once upon a time people were born into communities and had to find their individuality. Today people are born individuals and have to find their communities. These statements are culled from K-Hole & Box 1824’s online publication YOUTH MODE: A REPORT ON FREEDOM, an astute analysis of the complex intersections of youth culture, consumerism, generational branding and emerging trends that influence our sense of individuality, community and belonging. In a consumer and technological era awash in homogeneity, YOUTH MODE: A REPORT ON FREEDOM introduces terms such as “Mass Indie” to analyze the anxieties of finding individuality and being unique when differentiation is a group exercise of consuming organic food and fair-labor apparel. The term “Normcore,” on the other hand, describes liberation and freedom in being nothing special. It is about a society sorting through and learning how to understand individuality—today. Normcore is situational, adaptable, non-deterministic, unconcerned with authenticity, and post-aspirational. The publication YOUTH MODE: A REPORT ON FREEDOM explores these questions and others to propose that youth does not necessarily correspond to numerical age, but reflects a way of being. Youth is a continual preoccupation with freedom. It is the richness of potential and the possibility for connection in a mode of cultural engagement based on acceptance, not denial. A trend forecasting group based in New York. It was founded by Greg Fong, Sean Monahan, Chris Sherron, Emily Segal, and Dena Yago. Their reports are freely downloadable PDFs circulating in the realms of art and marketing. A market-research company specializing in eighteen- to twenty-four-year-olds. 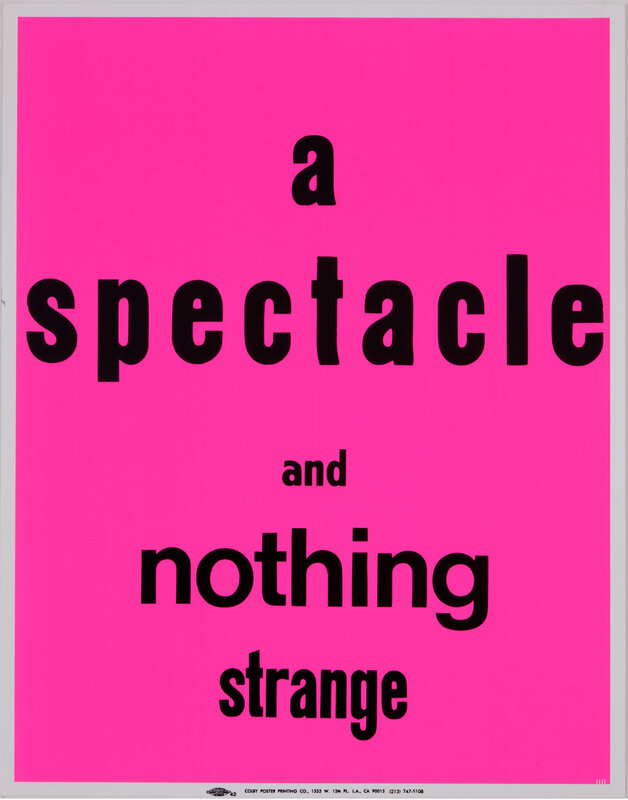 A Spectacle and Nothing Strange (2011–) is a series of letterpress posters with fragments of text culled from Gertrude Stein’s Tender Buttons (1914) and How to Write (1931). Fowler’s works were printed by the now-defunct Colby Poster Printing Company, a Los Angeles business that for more than sixty years made commercial posters advertising anything from music, wrestling and sporting events to carnivals, cheap car loans and hair care products. Fowler provided specific instructions to the printers to apply their seemingly endless combinations of colors and typographies to the posters. She then distributed them throughout the Los Angeles area, re-inserting the recognizable visual and graphics forms into the urban landscape of Los Angeles with a language not immediately discernable. While the colorful gradients and various typefaces of A Spectacle and Nothing Strange resonates with existing forms of advertising, the phrases such as “Very different but much more,” “Rub her coke,” and “Anyone telling anything is telling that thing,” make strange the associations of these advertising graphics. Fowler’s posters disrupt the expectations of everyday informational spaces, queering the experience of both language and public space. Eve Fowler studied journalism at Temple University in Philadelphia, Pennsylvania, and photography at Yale University in New Haven, Connecticut. Her work has been shown at the Museum of Modern Art, New York; Printed Matter, New York; Yerba Buena Center for the Arts, San Francisco, and the Hammer Museum in Los Angeles, among other sites. She has taught and lectured widely at institutions such as the University of Southern California and California Institutes of the Arts in Los Angeles; California College of Art in San Francisco; and Cooper Union in New York. Created entirely from found images, ALBUM is a compilation of the first ten issues of the Scandinavian zine of the same name created by Norwegian artists Eline Mugaas and Elise Storsveen. Since 2008, Storsveen and Mugaas have been sifting through printed material found in Scandinavian households from the 1960s through the 1980s then combining the visual matter into a fanzine, or limited edition, saddle-stich publication. Photographs and illustrations printed in a range of media from cookbooks, travel journals and etiquette manuals to fashion magazines, sexual manuals, and gardening and science journals are taken from original sources, juxtaposed, and reproduced in the ongoing zine. The publications are free of text. Each issue of ALBUM is dedicated to particular themes such as the lonely man, femininity, architecture, family, outer space, and nature. Here, consumerism, popular culture and domesticity seamlessly converge, reinforcing the fluidity and exchange among everyday life and onslaught of advertising and news media images. The Display Case exhibition presents a selection of original collages by Storsveen and Mugaas along with pages from ALBUM. James Hoff and Miriam Katzeff of Primary Information in collaboration with Teknisk Industri published ALBUM. Eline Mugaas studied at Ramapo College, New Jersey, and at the Cooper Union, New York. Her work has been shown in solo exhibitions including I Make Another Room, Face of young man half in shadow, and Skin flick at Galleri Riis in Oslo; Some Cities at the Bergen Kunsthall; and Let me be your one way street at Fotogalleriet, Oslo. Her work has also been part of the group exhibitions Millennium Magazines at MoMA, New York; Fake Snow at Galleri Riis, Oslo; and Synthetischer Natur at D21 Kunstraum, Leipzig. Her work is in public collections at the Rogaland Art Museum in Stavanger, Norway; the Preus Museum, Horten, Norway; and the National Museum of Art, Architecture, and Design, in Oslo. Elise Storsveen studied at the Norwegian National Academy of Craft and Art Industry and at the Norwegian National Academy of Fine Arts, Oslo. She has prevented exhibitions at Kunstnerforbundet; 0047; and Kunstnerens Hus with (Jon Gundersen), all in Oslo. She makes the fanzine ALBUM with Eline Mugaas, which has recently been presented at MOMA, New York; Kunsthalle, Zurich; and the New York Art Book Fair. She co-curated Hold Stenhårdt Fast På Greia Di, a retrospective of feminist artistic practice in Norway between the years of 1968 and 1989 at the Kunsthall, Oslo. Public commissions of her work include pieces at Ila Prison; St. Olav’s Hospital in Trondheim; and at the Litteraturhuset in Oslo. Primary Information is a non-profit organization formed in 2006 to foster intergenerational dialogue through the publication of artists’ books and writings by artists—emerging, mid-career, and established. The organization’s period of focus is from the early sixties to the present, with an emphasis on conceptual practice and the strategy of using publications as an exhibition space. Through a program that involves the publication of lost or unpublished material still vital to contemporary discussions; the publication of books by contemporary artists; and the publication of editions that function as publications, Primary Information aims to reach audiences throughout the world, those to whom publications can reach but galleries and museums cannot. When Karel Martens began studying art in Holland in the late 1950s, “graphic design” did not even exist as its own course of study. Today, he is widely recognized as one of the most important practitioners of that very discipline, with an esteemed client list that includes major publishers, architects, and institutions. Concurrent with his commissioned work, Martens has developed an impressive body of monoprints, which have been widely published, but only recently exhibited. Created on a small bookbinder’s press, the prints are a site for visual experimentation and formal research for Martens, who works on them nearly every day. They are made by imprinting found forms into recycled materials, such as castaway collection cards from museums, blank documents, discarded identity records, and raw packing paper. The motif on a single print my take several years to develop, subject to constant reexamination and overprinting by Martens. Sometimes, these images find their way into commissioned projects. Often, however, the prints exist only as unique fragments of an ongoing process of looking and thinking, occupying an unusual position between design and art. Indeed, Martens’s unwavering commitment to experimenting with printing processes, the graphic form, and construction of typographic meaning over the past half century has indelibly marked the visual and intellectual work of a younger generation of designers and artists. The selection of works at the Carpenter Center ranges from the late 1980s to present, and is displayed in an informal manner that reflects the open-ended and speculative method of its production. Since the initial presentation of his monoprints in 2012 at P! in New York, Martens’s letterpress works have been published in Artforum’s “Best of 2012, ” The New Yorker, Art in America, The Observer, Design Observer, and others. They have been exhibited internationally in the Netherlands, Japan, Australia, China, and England and are now in collections such as the Walker Art Center, Minneapolis; Museums of Modern Art Library and Archives, New York; and the Art Institute of Chicago. Martens’s accolades include the H.N. Werkman Prize (1993) for the design of the architectural journal Oase, the Dr. A.H. Heineken Prize for Art (1996), the Gold Medal at the Leipzig Book Fair (1998), the Gerrit Noordzij Prize (2012), and numerous other distinctions. He teaches regularly at the Yale School of Art and co-founded the Werkplaats Typografie in 1997. Martens is currently a mentor in the master’s program at the Design Academy Eindhoven (department Contextual Design). In de, da, do…da, commissioned for Display Case, Margaret Lee explores connections between gender and gesture and their legacy within the history of Abstract and Expressionist art. The installation confronts questions around mark-making and gendered indexical traces embodied in human movements. Does the appearance of scale and aggression, for example, result from an already engrained social reading and understanding of the gendered self? Does the mark of a man have an identifiable maleness, while the female a femininity, as inherent extensions of socially defined genders? The gestures are appropriated and manipulated from the “black pourings” of Jackson Pollock, a figure perennially celebrated for his innovative and, as critics have argued, masculine transference of embodiment onto canvas. Here, however, Lee mechanizes the painted gesture, transforming fluid paint into three-dimensional metal forms by scanning, laser cutting, and powder coating them, thus re-rendering the vaunted modernist action of Pollock into an unforgiving material associated more commonly with the appearance of contemporary luxury goods and retail display. Lifted from their places as marks on a canvas, Pollock’s individual gestures thus become a singular sequence of manufactured goods. The installation is then punctured–or interrupted–by a coupling of hardware made of industrially polished stainless steel shapes that include a flange, rod, and domed cap. The phallus and empty flange come together as a singular act by Lee to neutralize the original source of masculine gesture and propose equality, a step toward learning to re-read representations. Margaret Lee has exhibited widely both the U.S. and internationally. She participated in NO MAN’S LAND: Women Artists from the Rubell Family Collection (2015), Rubell Family Collection, Miami; Hammer Museum’s Made in L.A. biennial (2014); Lyon Biennale (2013), France; Sunbathers 2, 1857, Oslo, Norway (2014); New Pictures of Common Objects (2012), MoMA PS1, Long Island City; White Columns Annual (2011), New York; and closer to right than wrong/closer to wrong than right (2014), Jack Hanley Gallery, New York. In 2009, Lee founded the artist-run space 179 Canal, and is currently a partner at the gallery 47 Canal. Lee lives and works in New York City. Lee’s work is included in the public collections of the Solomon R. Guggenheim Museum; Dallas Museum of Art; Dikeou Collection, Denver; and the Astrup Fearnley Museet, Oslo. Installation view: K-Hole & Box 1824: YOUTH MODE: A REPORT ON FREEDOM (2014). Installation view: Margaret Lee: de, da, do...da (2016). 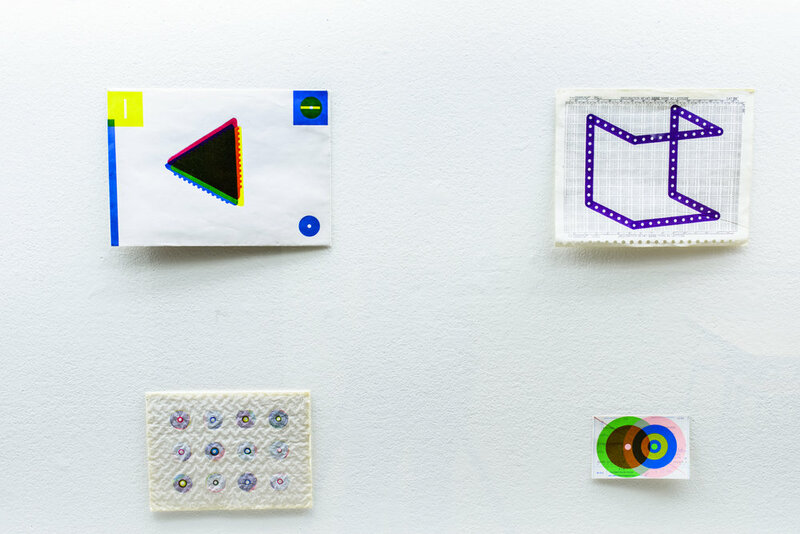 Installation view: Karel Martens: Monoprints (2015). Page from YOUTH MODE: A REPORT ON FREEDOM. Installation view: Eve Fowler: A Spectacle and Nothing Strange (2015). Installation view: Eline Mugaas and Elise Storsveen, ALBUM (2015).